You may have been using Google Spreadsheets for budgeting and project management but did you know that the same sheets application can also help you create impressive pixel paintings in minutes? The Google blog recently published a story of two illustrators who created a bright and beautiful wall mural using Google Spreadsheets. Marina and Mallory connected on Google Hangouts to plan and sketch out ideas, and creatively “hack” Sheets in order to make art: resizing cells into thousands of pixel-like squares, merging cells to create color blocks, creating vibrant color gradients with conditional formatting and cell values, and other cool things we had no idea you could do with Sheets. The idea is simple. Each cell in the spreadsheet corresponds to a pixel in the painting. You compute the color of the pixel and make it the background color of the corresponding cell. Now resize the spreadsheet cells in small perfect squares and your spreadsheet will look exactly like the original artwork. If you would like to create your own spreadsheet art but don’t have the time to carefully paint every cell manually, here’s a simple workaround for you. You can take any photograph, vector art, or any other image and use a Google Script to convert that bitmap image into spreadsheet art. 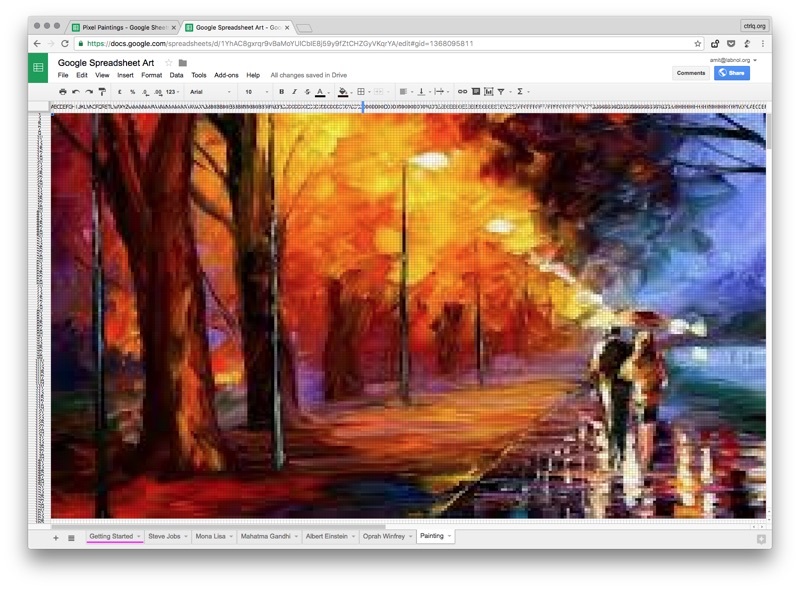 Watch the video tutorial or open this Google Sheet for sample artwork. It takes few easy steps to make pixel art with Google Sheets. You can use any free image but make sure they are 300 pixels or less for optimal performance. Open the Google Spreadsheet template and copy it to your own Google Drive. Go to the Spreadsheet Art menu, choose the Image Upload option and select the picture that you’ve downloaded in the previous step. The sheet will now parse every single pixel of your image and write the corresponding hex color codes in the spreadsheets cells. Select the “Apply Colors” option and the Google Script will set the background color of every spreadsheet cell equal to the cell value. The cells in the spreadsheet are rectangles whereas pixels are perfect squares. Select step 3 to resize every cell in the spreadsheet as a square. And that’s it. Your spreadsheet art is now ready. The end result may appear slightly pixelated (video) because we have used a small image as the source template but impressive nonetheless. You can download the Google Sheet as a PDF file or save it in Microsoft Excel format.